Build powerful back-end business logic and complex Enterprise JavaBeans (EJB)-based applications using Java EE 8, Eclipse Enterprise for Java (EE4J), Web Tools Project (WTP), and the Microprofile platform. Targeted at Java and Java EE developers, with or without prior EJB experience, this book is packed with practical insights, strategy tips, and code examples. As each chapter unfolds, you'll see how you can apply the new EJB spec to your own applications through specific examples. 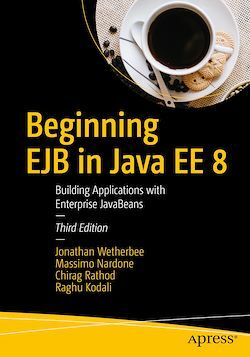 Beginning EJB in Java EE 8 serves not only as a reference, but also as a how-to guide and repository of practical examples to which you can refer as you build your own applications. It will help you harness the power of EJBs and take your Java EE 8 development to the next level. You'll gain the knowledge and skills you’ll need to create the complex enterprise applications that run today's transactions and more. Java programmers new to enterprise development and for those who may have experience with EJBs but are new to Java EE 8, EE4J, and related Eclipse projects.